See attached PDF for specific models and offers. 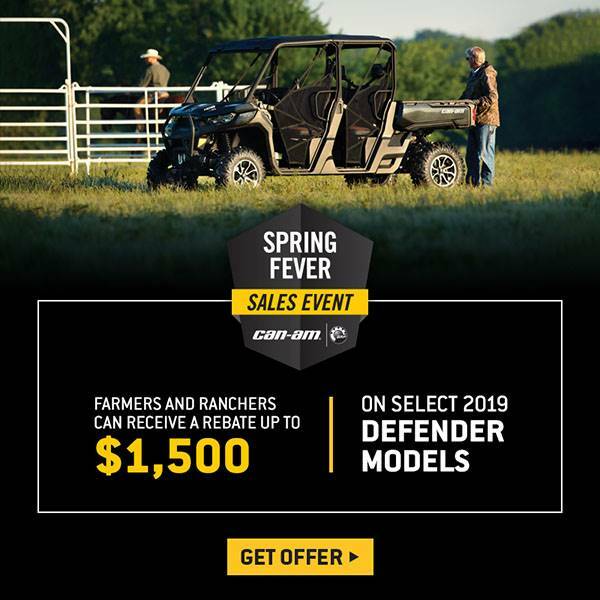 †Get up to $1,500 ON SELECT 2019 DEFENDER MODELS: Eligible units are select new and unused 2018 Can-Am DEFENDER models. Eligible buyers are agricultural businesses approved under the BRP AGRICULTURE & RANCH / FARMER PROGRAM. The eligible buyer of an eligible unit will receive a rebate of up to $1,500. Rebate amount depends on the model purchased. While quantities last. Other conditions may apply. See your dealer for details.